Combine supplements of OptiVERO. Prepare complementary reagents. Wash cells to remove traces of FBS and harvest from growth surface. Seed in OptiVERO and expand in cell culture flasks for at least 3 passages to allow for adaptation. Prepare microcarrier system, inoculate with VERO cells, and incubate 3-4 days for adhesion and expansion. Add virus of interest in minimal basal MEM. Incubate for 2 hours at 37°C. Add fresh OptiVERO. Allow virus expansion for 3-13 days. Quantify virus by desired method. VERO cells exhibit commercially acceptable doubling times and viability when grown in 10% fetal bovine serum (FBS). 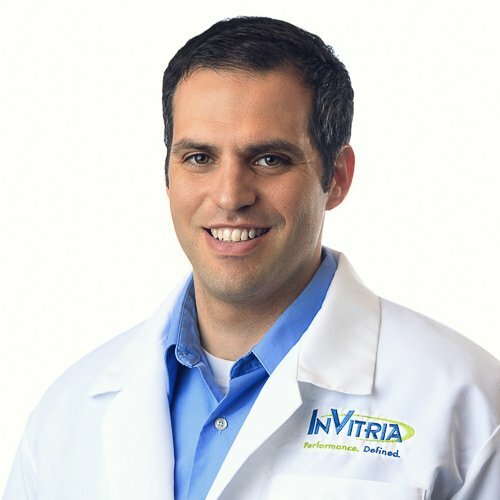 However, current guidance by regulatory bodies in addition to Good Manufacturing Practice (GMP) compliant manufacturing of cell-based, advanced therapy medicinal products (ATMPs) states that alternatives to FBS should be utilized due to poor reproducibility and safety concerns associated with FBS use [4,5]. Popular serum-free media (SFM), such as VP-SFM, contain high levels of undefined hydrolysates that can cause batch-to-batch variability in performance. For this reason, there is a need for a defined media that is free of serum or animal components. Here, we investigate the performance of a chemically defined and blood-free, OptiVERO, in supporting VERO cell growth and virus production in 3D dynamic polystyrene microcarrier cell culture, compared to FBS and VP-SFM. To generate 1 liter of complete OptiVERO, thaw one OptiVERO Media Supplement and one OptiVERO Protein Supplement in a 37⁰C water bath. Do not subject the Protein Supplement to multiple freeze-thaw cycles. Once the supplements are completely thawed, mix them by gently pipetting up and down. Do not vortex. Add 20 mL from the OptiVERO Media Supplement directly to the OptiVERO Base Media. Add 10 mL of OptiVERO Protein Supplement directly to the OptiVERO Base Media. This medium contains HEPES and glutamine source. If desired, add gentamicin/amphotericin to 0.1-0.5x final concentration. Do not add to a 1x final concentration. Avoid repetitive heating and cooling of the complete medium by withdrawing and pre-warming only the volume needed in the final culture vessel to be used. To a 1 g container of soybean trypsin inhibitor, add 8 mL of DPBS and allow the powder to reconstitute at room temperature for at least 3 hours prior to use. Avoid the excessive formation of bubbles during reconstitution by allowing the vial to sit undisturbed. Upon successful reconstitution, pipette the solution up and down with a 10 mL pipette to achieve adequate mixing. Pass the solution through a 0.22 µm PES syringe filter into a sterile 15 mL tube. Weigh 1.86 g of dry EDTA on an analytical balance and bring the solution up to 50 mL with DPBS. Once the EDTA has dissolved into solution, sterile-filter the solution using a 0.22 µm PES syringe filter into a sterile 50 mL tube. Store the solution at 4°C for up to 6 months. To a sterile 250 mL media bottle, aseptically add 222.5 mL of DPBS followed by 25 mL of 10x TrypLE and 2.5 mL of 100 mM EDTA. Store the solution at 4°C for up to 6 months. This solution may be heated and cooled repeatedly without affecting the activity of the enzyme. Dilute 50X soybean trypsin inhibitor to 1x in dPBS (0.05 mL/cm2 volume needed). For additional information about VERO cell growth and maintenance in OptiVERO, please refer to the Application Note: "Expansion of VERO Cells Without Serum in Chemically Defined Cell Culture Media"
Aliquot 0.2 mL/cm2 OptiVERO into the desired culture vessel and allow the media to equilibrate in the incubator for at least 30 minutes. Prewarm the diluted soybean trypsin inhibitor and 1x TrypLE in a 37°C water bath. Wash VERO cells with 0.5 mL/cm2 dPBS twice to remove all traces of serum. Tap the side of the vessel to ensure all cells have been removed from the growth surface. After cell detachment is observed, add an equal volume of soybean trypsin inhibitor followed by 0.2 mL/cm2 DPBS to dilute out the enzyme. Collect the cells in a 50mL conical tube. Wash the surface and collect any remaining cells with 5-10 mL prewarmed media. Pellet by centrifugation at 1000 RPM for 5 minutes. Resuspend cells in a minimal volume of prewarmed OptiVERO and count. Seed cells at an initial cell density of 10,000-20,000 cells/cm2. VERO cells should be sub-cultured every 3 to 5 days. At time of subculture, repeat the procedure above. The typical surface area/mL for plastic microcarriers (MC) is shown in Table 1. Development runs consisted of 150 mL of media containing 10 cm2/mL MCs for a total of 1500 cm2 spinners. Wash and dry spinner vessel according to house procedures. Autoclave to sterilize. Allow the spinner to cool for at least 4 hours prior to starting inoculation process. When the microcarriers are ready, add 100 mL of cold OptiVERO immediately followed by MCs to the vessel. Do not allow OptiVERO to warm in the spinner without microcarriers as excessive adsorption of media components to the glass will affect cell adhesion to the microcarrier beads. NOTE: microcarrier beads add ~7-20 mL of volume depending on the number of microcarriers and residual volume from the microcarrier washes. Therefore, adjust the amount of media used to transfer the microcarrier beads into the vessel. Total volume of spinner after microcarrier addition should be approximately 135 mL. Wash tube containing the MCs with an additional volume of OptiVERO to be sure to transfer all microcarrier beads. Transfer the spinner to the incubator and begin stirring the microcarriers at 40-50 RPM. VERO cells at 70-80% confluence in 2, T-150 flasks are generally adequate to seed 1 spinner at an initial cell density of 10,000 cells/cm2. Wash and trypsinize cells according to the subculture section of this protocol. Pellet and resuspend cells in 5 mL of prewarmed OptiVERO. Prior to seeding cells into the spinner, pass the cell suspension through a 0.7 µm nylon cell strainer in order to obtain a single-cell suspension. Count cells and adjust to 1x106 viable cells/mL in a total of 15 mL of OptiVERO. Obtain the equilibrated spinner from the incubator. While the spinner is stirring at 40 RPM in the hood, slowly add the 15 mL of cell suspension. Place the spinner back in the incubator and do not disturb the spinner for at least 4 hrs. Starting at Day 2, spinners should be monitored every day for culture glucose levels and pH. Culture glucose should be maintained at 2 g/L final by the addition of a 45% glucose solution. Culture pH should be maintained between 6.9 and 7.2 with the addition of 7.5% sodium bicarbonate solution. If desired, culture samples can be obtained at this time to monitor cell growth and quantified by method of choice. After seeding on the microcarriers, allow the VERO cells to grow for 3-4 days under standard growth conditions and stirring speeds. On the day of infection, remove the spinner flasks from the stirring platform and allow the microcarrier beads to settle to the bottom of the flask (approximately 5-10 minutes). Once the microcarrier beads have settled completely, remove 75% of the growth medium. Inoculate the culture with the virus of interest, at 0.001-0.01 PFU/cell in basal MEM. Stir spinner flasks at the slowest possible speed to gently suspend the microcarriers for 2 hours at 37°C. Add fresh, prewarmed OptiVERO to restore the working volume back to the original culture volume, prior to the infection process. Here, a blood- and serum-free, chemically defined virus-production media known as OptiVERO is evaluated for its ability to support VERO cell growth kinetics and virus production, compared to media supplemented with FBS and to VP-SFM. In 3-D dynamic microcarrier cultures, VERO cells cultured in OptiVERO readily attached to the microcarrier beads and demonstrated a significantly higher cell expansion to either FBS (***) or VP-SFM (###) as determined by One Way ANOVA. ***p ≤ 0.001 (Figure 1). At day 5 post inoculation, the cells reached stationary phase where OptiVERO was demonstrated to be 1.7 x 106 cells/mL while FBS and VP-SFM were 8.8 x 105 and 1.1 x 106 cells/mL, respectively. An attenuated Dengue strain was used as a model virus to demonstrate the virus production capabilities of each medium (Figure 2). Cells were expanded in each medium for 3 days in microcarrier culture. Dengue virus was added on the cells and was propagated for 11 days, with samples removed for plaque titration every other day. The Dengue virus growth plateaued at day 9 and was determined to be 3.75 x 108, 4.6 x 108, and 5.3 x 108 PFU/mL for EMEM + 10% FBS, VP-SFM + 4 mM Glutamine, and OptiVERO, respectively. 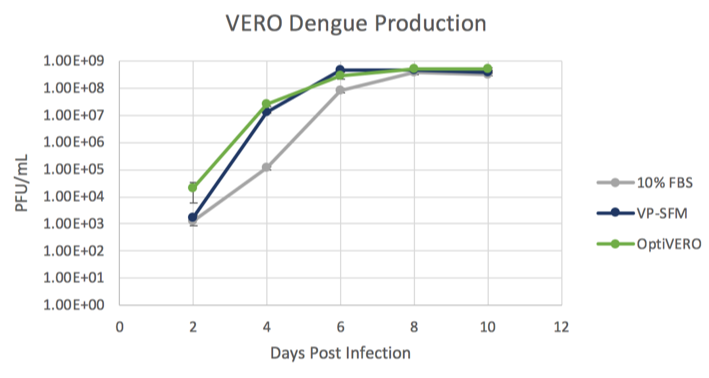 Taken together, these data show that VERO cells grown in OptiVERO performed with growth kinetics and virus production capabilities similar to those grown in 10% FBS. Further, OptiVERO exhibited superior growth kinetics to hydrolysate-containing medium, VP-SFM. Ammerman NC, Beier-Sexton M, Azad AF. 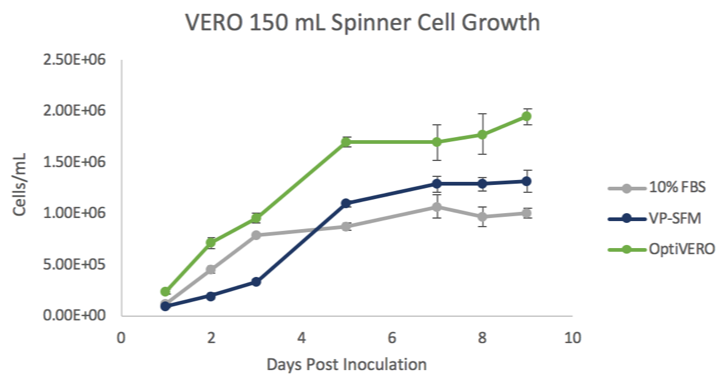 Growth and maintenance of VERO cell lines. Curr Protoc Microbiol 2008;Appendix 4:Appendix 4E. Montagnon BJ, Fanget B, Nicolas AJ. The large-scale cultivation of VERO cells in micro-carrier culture for virus vaccine production. Preliminary results for killed poliovirus vaccine. Dev Biol Stand. 1981;47:55-64. Montagnon B, Vincent-Falquet JC, Fanget B. Thousand litre scale microcarrier culture of VERO cells for killed polio virus vaccine. Promising results. Dev Biol Stand. 1983;55:37-42. Note for guidance on minimising the risk of transmitting animal spongiform encephalopathy agents via human and veterinary medicinal products (EMA/410/01 rev.3). Official Journal of the European Union 2011;C73:1-18.
van der Valk J, Bieback K, Buta C et al. Fetal Bovine Serum (FBS): Past - Present - Future. ALTEX 2018;35:99-118.